Manchester City defender Kieran Trippier has been called into the England Under-21 squad for the first time ahead of Friday's Romania match. The 20-year-old, currently on loan at Barnsley, is the only change made by coach Stuart Pearce ahead of the European Championship play-off. England have lost three players - Micah Richards, Kieran Gibbs and Alex Smithies - to injury. Friday's first leg takes place at Norwich's Carrow Road ground. The second leg will take place in Botosani, Romania next Tuesday, with a place in next summer's finals in Denmark at stake for the winners. Has Stuart Pearce picked the strongest side available? Manchester City defender Richards, Arsenal full-back Gibbs and Huddersfield keeper Smithies have all returned to their clubs for treatment. 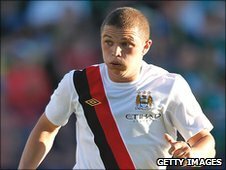 Trippier has yet to play a competitive game for Manchester City but has already represented his country at Under-20 level. England Under-21 squad: F Fielding (Blackburn), S Loach (Watford), J Steele (Middlesbrough); R Bertrand (Chelsea), K Trippier (Manchester City), P Jones (Blackburn), M Kelly (Liverpool), M Mancienne (Chelsea), C Smalling (Manchester United), K Walker (Tottenham); M Albrighton (Aston Villa), T Cleverley (Manchester United), J Cork (Chelsea), J Henderson (Sunderland), H Lansbury (Arsenal), F Muamba (Bolton), D Rose (Tottenham), J Wilshere (Arsenal); N Delfouneso (Aston Villa), D Sturridge (Chelsea), D Welbeck (Manchester United).